Outside my window…the sun is smiling upon us; the humidity, though, seems to be mocking us. I am thinking…it’s September. Soon it will officially be fall. I love the crispness of fall and the change of leaves. I love the cool mornings and the drop in humidity. I love pumpkin season and Thanksgiving. I know fall, as I’m describing it, comes later than it’s official day here in South Texas, but I am still eagerly awaiting its arrival. From the learning rooms…we’re starting school on Monday and I am thrilled. I miss having a schedule; a defined routine. This past summer (with little routine and days of saying to Joseph and William, “what shall we do today?”) brought back memories of growing up. My dad was in the Navy, often deployed for months at a time. My mom is a bit undefined when it comes to her time. She stays up late and marches to the beat of her own schedule, which is, in essence, no schedule. She’s spontaneous and easily adaptable, which for me is fun for about a day, then suddenly I feel lost. I function quite well on a schedule. Oh, who am I kidding? I crave it. I pine for it. I’m addicted to routine. I remember anxiously waiting for Dad to return from deployment, knowing that when the Captain was home there would be routine, a set schedule. Yep, I’ve always been this way. From the kitchen…Mom and I are going to attempt to cook from the Uncheese Cookbook. Whatever nutritional yeast flakes are, they seem to be important to the process of faking cheese. We’ll see. I am wearing…a blue polo shirt and black shorts. No, I don’t match. Yes, I’ll dress nicer someday. I am creating…I am one step further in finishing that scrapbook that I vaguely mention from time to time. I have finally pulled all of the pictures out. That’s all I’ve done…I still have a ways to go, but at least the mess on the table reminds me that I have a project to finish. I am going…to try to work on my DAR application. Those old Census reports are a little confusing at times. I am reading…Karen Andreola’s A Charlotte Mason Companion, but I’ve also decided to go straight to the source, so each day I’m reading a little of Charlotte Mason’s own writing. I am hearing…Joseph telling the story of the Three Billy Goats Gruff. Around the house…Mom and I finally sorted through the yarn today. I cringed each time I placed a skein on her lap, allowing her the opportunity to take it home. I see such potential in each skein, but reality hit a few weeks ago when I realized that it’s a shame to just leave all that yarn sitting there, unused, rolled into neat little skeins when they could be knitted into glorious projects and now is not the season of my life for knitting. So I am parting with my clutter and those dear skeins of yarn. Besides, when I finally discover time for knitting, it will be fun to go pick something new. One of my favorite things…clearing out clutter! So even though I’m sad to see the yarn go, I am relieved to find space in its place! A few plans for the rest of the week: A few last minute things to get done before school on Monday; some baking with Mom; dinner with Dax. 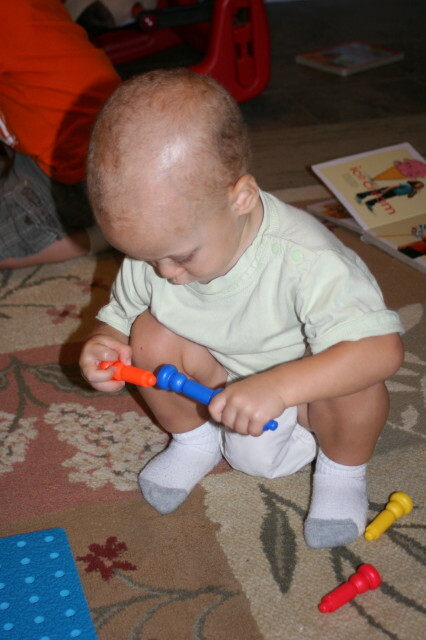 A peaceful moment in our house as William concentrates to stack his pegs. All must be well now that you are back on schedule.